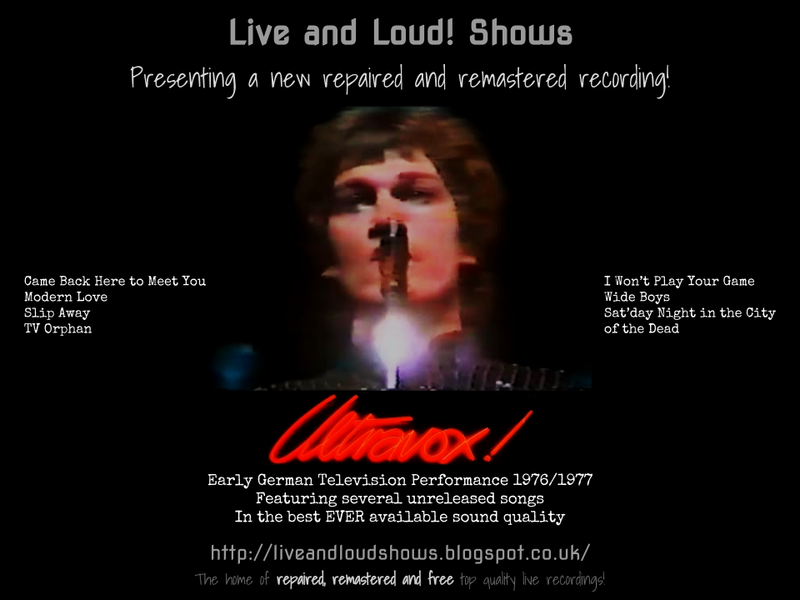 This time we feature Ultravox with the soundtrack to an extremely rare performance on German TV. It's unusual because there’s almost no information about where it was recorded! It's generally only seen as a video or series of videos labeled “Rockpop 1976” - Rockpop was the name of a music programme on German TV but didn’t start until 1978! The setlist however, features only tracks from their 1st album (released in February 1977 along with 1 track Modern Love, which appeared as a free single with limited copies of their 2nd album Ha!Ha!Ha!, released in September 1977. 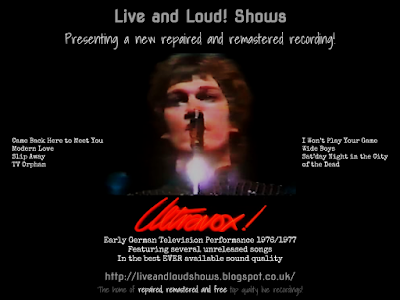 The other 3 tracks are to this day, unreleased and not available anywhere else - so perhaps it's more likely that the recording dates from some time in 1977 (indeed, a couple of people have since suggested this is the case, 1 claim is that it was actually recorded in the UK in early 1977 and broadcast on German TV later - can't find a source for this to confirm and no further details forthcoming at the moment. In any case, the recording is prized due to featuring those rare tracks. While it is quite short, remember this was originally from a VHS recording of a muddy sounding TV broadcast so I spent a lot of time on this - removing tiny gaps or breaks in the sound, before rebalancing the audio and EQing everything to bring out as much as possible. So vocals, drums, guitar and bass are all far clearer and separately identifiable - you can even hear Billy Currie's keyboards a bit more often now. Thank you for this nice show !